Sunday February 20th 1921 It is 21 years today since Ott told Will and me about The Coralville place we bought. It was the day Father & Mother were married in 1845. The Pickens went away for the day. I to church with Mr & Mrs Falk. wrote Jim Dunlap and Mrs Moore at Daytons. Later a letter to Grace Taylor. Evening all at town. Monday February 21st 1921 I did a little writing in AM. I went down town with the folks after dinner. Called at Mrs Burns. It was raining a little as we came home. Tuesday February 22nd 1921 I was home all day. The folks did washing and Mrs Falk did her ironing. I slept awhile in the afternoon. A fine day. Wednesday February 23rd 1921 Mrs Falk and I were down town all day. I got me a hat. Called at Taylors. Wrote Hattie & Ida and read some in Library. Had letters from both later. Some of the folks to town in evening. a shower at supper time. 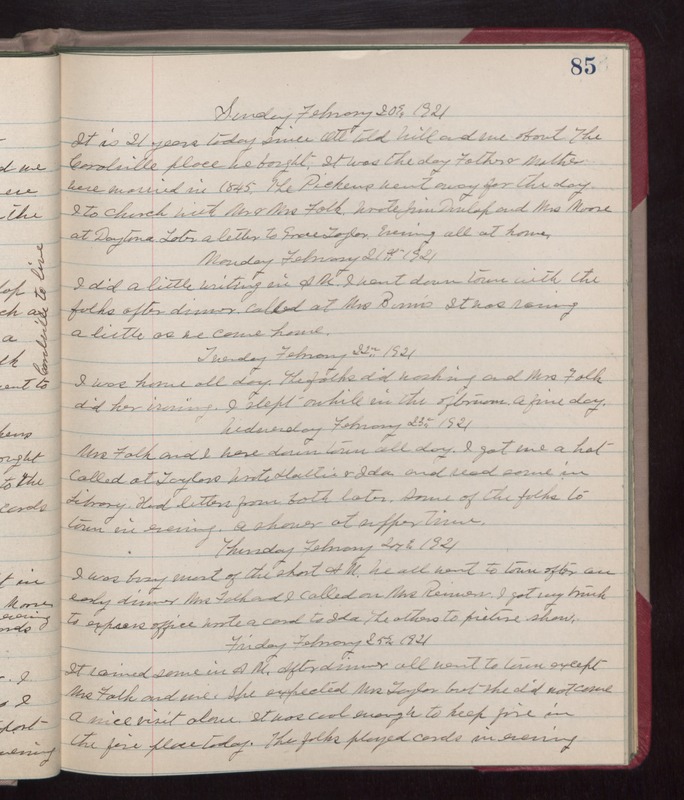 Thursday February 24th 1924 I was busy most of the short AM. We all went to town after an early dinner. Mrs Falk and I called on Mrs Reimer. I got my trunk to express office. Wrote a card to Ida. The others to picture show. Friday February 25th 1921 It rained some in AM. After dinner all went to town except Mrs Falk and me. She expected Mrs Taylor but she did not come. A nice visit alone. It was cool enough to keep fire in the fire place today. The folks played cards in evening.